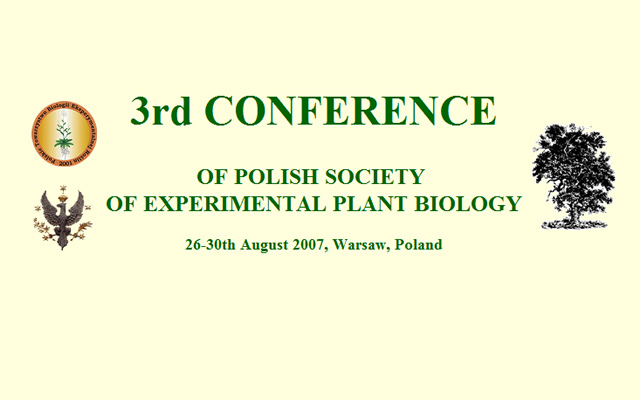 On behalf of the Polish Society of Experimental Plant Biology and Faculty of Biology of Warsaw University, we would like to invite all scientists to attend the 3rd Conference of Polish Society of Experimental Plant Biology which will be held in Warsaw, Poland, on August 26–30, 2007, at the Faculty of Biology, Miecznikowa 1, Warsaw, which is based at the Ochota Research Center. Topics covered by the Conference include: plant structure and function, gene expression and regulation, plant bioenergetics, mechanisms of plant growth and development, plant interactions with other organisms, integration of metabolism of plant cell and signal transduction in response to stress. Faculty of Biology, University of Warsaw.